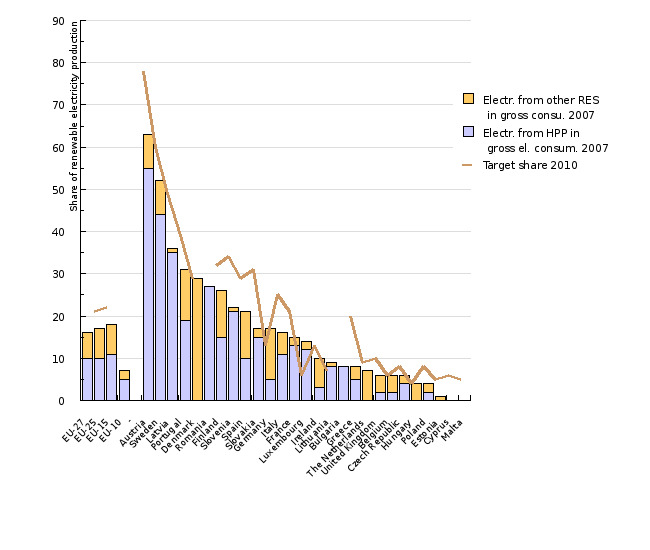 Electricity production from RES in 2008 was significantly higher than the year before that due to higher water stages and the start-up of the co-incineration of wood biomass in larger thermal energy facilities. However, in 2008 Slovenia still stayed behind the set objective for 2010 by 13 %. The indicator electricity production from renewable energy sources shows the production of electricity from wind, solar, geothermal and water energy as well as from biomass. Electricity production from biomass includes production from wood and wood waste, renewable waste (liquor, straw, etc. ), municipal solid waste, biogas (landfill gas, gas from purification facilities, other biogases) and liquid biofuels. Jožef Stefan Institute, 2009; Statistical Office of the Republic of Slovenia, 2009. Ministry of the Environment and Spatial Planning, 2009. - 25 % share of RES in total energy consumption for 2020. Electricity production from renewable energy sources is the friendliest method to the environment, since it causes the minimum amount of greenhouse gas emissions and air pollutants. Naturally, there are differences between sources with regard to their environmental impacts. The use of wood biomass causes similar NOx emissions as natural gas; if used in older boilers, it causes large emissions of volatile organic compounds and dust particles. Furthermore, over-consumption of wood biomass may influence the biological diversity or industrial branches that use wood as a raw product. Larger hydroelectric power plants have a huge impact on the landscape and represent a disturbance for ecosystems and hydrology. The production of some photovoltaic modules requires the use of heavy metals, etc. Detailed planning of the use of renewable energy sources can reduce these negative impacts to a minimum. For environmentally-friendly electricity, electricity production from RES must be increased; namely, in a faster manner than the growth of total electricity production. Therefore, within the framework of the indicator, it is reasonable to monitor the share of electricity from RES, since this provides information on whether electricity production is becoming environmentally friendly or not. Renewable energy sources in Slovenia significantly contribute to electricity production and the coverage of its electricity needs. In 2008, their share in gross electricity consumption amounted to 29.1 %. With regard to the previous year it increased by 7 percentage points, while with regard to 2000 it decreased by almost 3 percentage points. It was lower than the objective by 4.5 percentage points. In 2008, gross electricity consumption was, with regard to 2000, more than 20 % higher, and electricity production from RES 10 % higher. If gross electricity consumption remained at the level of 2000 and production from RES maintained its growth, the share would amount to 35 %. A significant increase in production until 2004 was recorded for landfill gas, which is primarily due to the implementation of the Decree on the landfill of waste and the Rules on the landfill of waste, since both demand energy use of landfill gas. In 2008, production amounted to 32 GWh, which is 256 % more than in 2000; the year before that it increased by more than 10 %. Electricity production from wood and wood waste in 2008 was, with regard to 2000, more than 300 % higher, and with regard to the previous year 270 % higher. Such an increase is a result of the start-up of co-incineration of wood biomass in larger electricity and heat production units run on coal in the thermal power plant in Šoštanj, thermal power plant in Trbovlje and thermal power-heating plant in Ljubljana. Prior to that, biomass was used only in industrial CHP plants. Electricity production from other biogases, where agriculture prevails, increased in 2008 by 26 %. Since 2000, production has increased by almost 754 %. Such growth is a result of the good operation of the system of fixed redemption prices. A similar case applies to electricity production from the sun, which is not monitored by SORS. In 2008, it increased by 132 %, so that it amounted to more than 2 GWh. In total electricity production, solar energy represented 0.05 %. Until 2012, additional electricity production from RES in the amount of 708 GWh or an increase in capacities by 221 MW, with regard to 2007, is expected. A detailed presentation of additional production is shown in Figure EN19-5. The most important of the measures for the promotion of electricity production from RES is the system of fixed redemption prices that was renewed in 2009. It is regulated by the Regulation on supports for electricity generated from renewable energy sources and Energy Act. The system operates in the same way as with electricity and heat co-production. Investments in new facilities are also promoted by the Eco fund through favourable loans. Electricity production from renewable energy sources in 2007 represented 16.6 % in the EU-27, which is 1.0 percentage point more than in 2006. With regard to 2000, the share was 1.8 percentage points higher. In the EU-25, the share was a little lower with 16.5 %; however, the trends were 0.1 of a percentage point higher. Despite an increase in electricity production from RES, the EU-25 is still far away from the objective set for 2010 (21 %), which most probably will not be achieved. A similar case can be claimed for the EU-15, where the share in 2007 amounted to 17.6 %, while the objective for 2010 amounts to 22.1 %. The objective for 2010 among Member States has already been achieved by Germany, Lithuania, Luxembourg and Hungary, while Denmark and Belgium are close to it. The changes in the share in the period 2000–2007 in the EU-27 Member States strongly vary. The share has decreased the most in countries that produce all or the majority of electricity from RES in hydroelectric power plants, such as Greece, Bulgaria, Slovenia, Romania and Latvia. 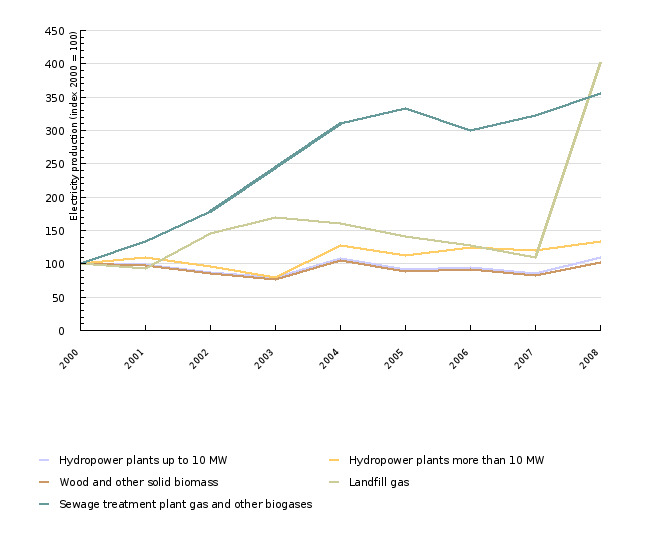 In the EU-27, only electricity production in hydroelectric power plants decreased in the period 2000–2007, which is a result of bad hydrological conditions; on the other hand, production from solar energy increased the most. 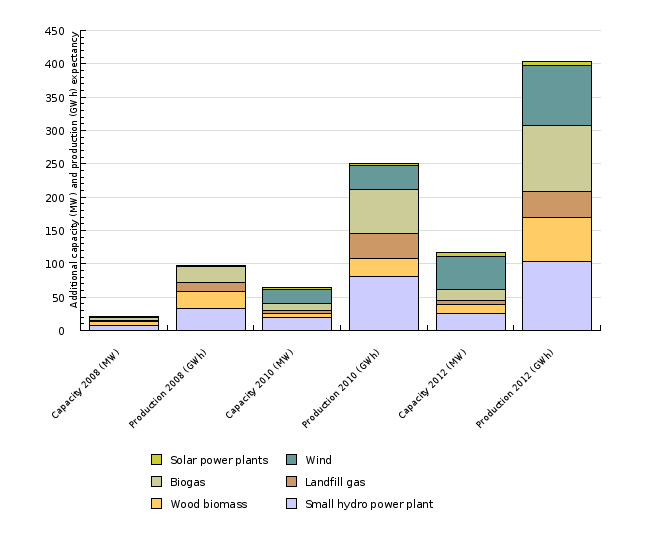 Production from wind energy and biomass, including wood and biogases, has also strongly increased. Objectives summarised by: Resolucija o Nacionalnem energetskem programu (ReNEP) (Resolution on the National Energy Programme, Official Gazette of the RS, No. 57/04) and proposal of the climate-energy package. - Joint questionnaire - EUROSTAT (to 2002) and EUROSTAT > Environment and energy. - SI-STAT Data Portal > Environment and natural resources > Energy > Renewables and wastes. Methodology and frequency of data collection for the indicator: The data on electricity production were prepared (collected) on an annual basis and published on the web pages of SORS and in printed publications. Furthermore, the data were communicated to the Statistical Office of the European Communities (EUROSTAT). The EUROSTAT/IEA methodology was used for the preparation of data. Two different sources of information were used – before 2002 the source of information was the EUROSTAT questionnaire, and since 2002 the official statistics of SORS. 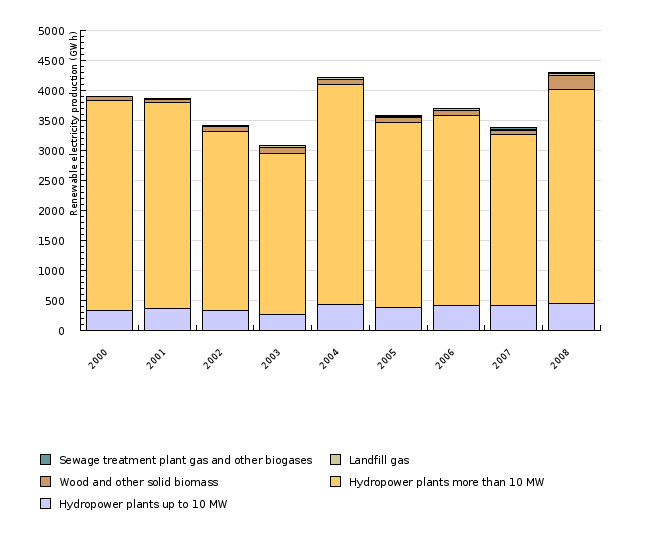 For the period after 2002, the data on electricity production from renewable energy sources, collected by the Statistical Office of the Republic of Slovenia, were used. The data before 2002 were obtained from the EUROSTAT questionnaire. 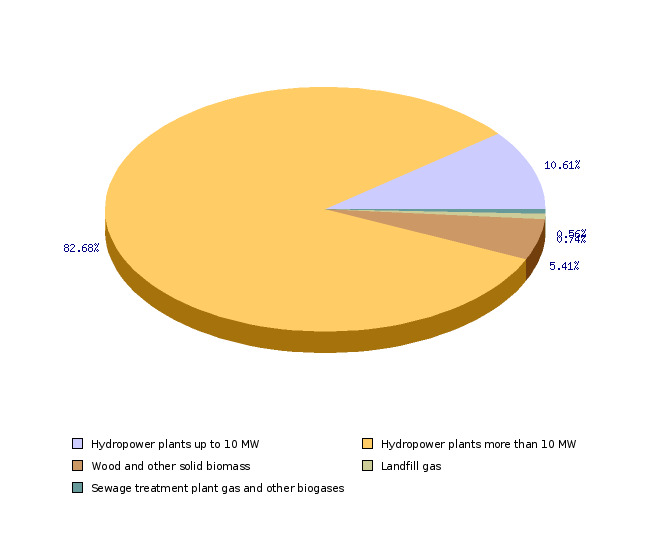 The data on production for hydroelectric power plants, wood and wood waste and biogas were obtained. 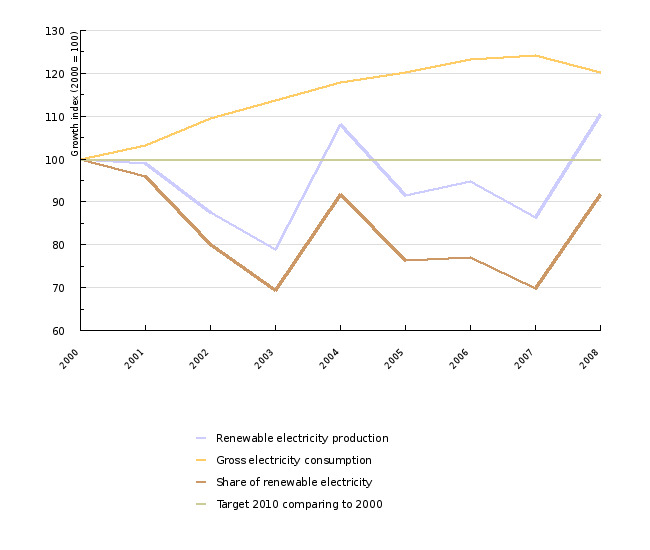 The data on electricity production from solar energy were obtained for 2004–2007 in the EurObserv'ER barometers. The data for the EU-27 for the period 2000–2008 were obtained from the EUROSTAT database. For the calculation of the share of electricity from RES, the electricity production from RES is subdivided into the gross domestic electricity consumption, which is calculated as the sum of gross (on generator) domestic electricity production from all fuels, and the net import (import of electricity minus export). The share of electricity from RES in gross electricity consumption is calculated as a quotient of electricity production from RES (hydropower 5510-100100, wind energy 5520-100100, solar energy 5534-100100, geothermal energy 6000-107002, biomass 6000-107011) and gross electricity consumption (gross electricity production plus import minus export). Annual growth for the indicator is sometimes indicated in percentage points. A percentage point includes an absolute comparison calculated by the formula (nthis year)–(nlast year)=16 %–15 %=1 pp (for instance: if last year the growth was 15 % and this year 16 %, then this year the growth was higher by 1 percentage point). 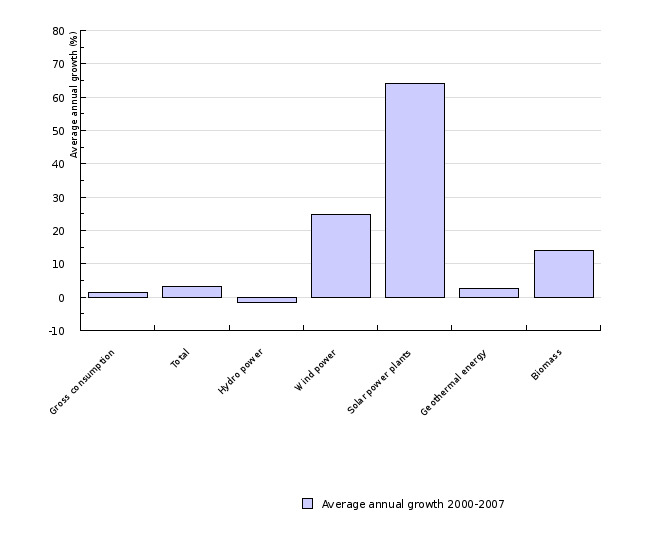 The difference in growth can also be expressed in a relative comparison using the formula [(nthis year/nlast year)*100]–100=[(16 %/15 %)*100]–100=6.7 %, where the growth is indicated in percentages. Geographical coverage: The EU-15 is composed of old EU Member States: Austria, Belgium, Denmark, Finland, France, Germany, Greece, Ireland, Italy, Luxembourg, the Netherlands, Portugal, Spain, Sweden, the United Kingdom. The EU-10 (NMS-10) includes Member States that joined the EU in 2004 (Cyprus, Czech Republic, Estonia, Hungary, Lithuania, Latvia, Malta, Poland, Slovenia, Slovakia). The EU-25 includes the EU-15 and EU-10. The EU-27 includes the EU-25 and Bulgaria and Romania. - Advantages and disadvantages of the indicator: Officially reported data, calculated on the basis on internationally verified methodologies, were used for the calculation of the indicator. The SORS data do not contain all renewable energy sources (solar energy). - EurObserv'ER, 2008. Barometri za fotovoltaiko (Barometer for photovoltaics). - HSE, 2008. Website of the Holding Slovenske elektrarne. - Uredba o odlaganju odpadkov na odlagališčih (Decree on the landfill of waste, Official Gazette of the RS, No. 32/06, 98/07, 62/08, 53/09).